MainAll NewsInside IsraelTrump to give David Friedman control of PA affairs? Trump to give David Friedman control of PA affairs? 5 US officials claim president mulling plan to place US J'lem consulate under ambassador's control, giving him authority over ties with PA.
Less than a month after the US embassy in Israel was relocated from Tel Aviv to Jerusalem, President Donald Trump is weighing another change to the US diplomatic mission in Israel. 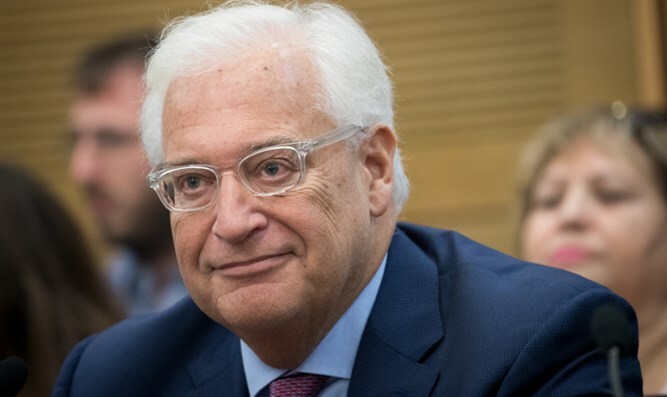 According to a report by the Associated Press early Friday morning, President Trump is considering a request by the US Ambassador to Israel David Friedman that the Jerusalem embassy be given authority over America’s other mission in Jerusalem – the Jerusalem consulate. While the US converted one facility in the Arnona neighborhood used by the Jerusalem consulate, the consulate maintains separate facilities in the Israeli capital for offering passport and visa services to residents of eastern Jerusalem and Judea and Samaria, as well as for handling affairs in the Palestinian Authority. Five US officials told AP Trump is considering Ambassador Friedman’s request, which would place the Jerusalem consulate general directly under the embassy’s authority, giving the ambassador influence over US ties with the Palestinian Authority. The change, if implemented, would bring the arrangement of the US mission in Israel more in line with standard diplomatic practice by the State Department. In most cases, American consulates are operated by the local US embassy. At present, however, the US consulate general in Jerusalem operates independently of the embassy, reporting directly to the State Department. The de facto independence of the consulate in Jerusalem has been seen by the PA as an implicit sign of US support for the eventual establishment of Palestinian statehood and the partition of Jerusalem. While the president has not yet ruled on Friedman’s request, the sources told AP that they expect the embassy to be eventually given authority over the consulate. David Shapiro, who served as US Ambassador to Israel during most of the Obama administration, counselled against the move, claiming it would further enrage the Palestinian Authority. "They don't want to deal with the U.S. embassy to Israel as their channel," said Shapiro.